We’re happy to announce that digital tickets for the next news:rewired are now available, so even if you can’t make it to the conference itself you still have a chance to catch the talks and sessions from the day. The event, at MSN HQ in London on Wednesday 23 July, brings leaders in digital journalism together to discuss their work, share advice and lead workshops in relevant areas. As well as the networking opportunities and extra materials available on the day, there will be focused post-lunch workshops looking at mobile apps and tools for journalists; creating immersive, longform stories; and using analytics to understand the audience. While these workshops will give delegates a practical, hands-on guide to the particular subjects, they will not be filmed, and will not be included in the digital ticket offering. There is also a full day of training the day after the conference, with a choice of courses in mobile journalism with RTÉ’s Glen Mulcahy, data journalism with Conrad Quilty-Harper of Ampp3d, or creating a buzz on social media with BuzzFeed UK editor Luke Lewis. Following another sell-out event in February, we’re pleased to announce our next news:rewired conference will take place on Wednesday 23 July. 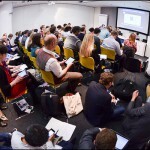 The one-day conference, which is run by Journalism.co.uk, will cover key areas of innovation and experimentation in digital journalism, with a focus on sharing practical tips and techniques to help delegates produce more engaging content on digital platforms. More details on the agenda and speaker list will available soon. If you want to make a suggestion, please feel free to email rachel[at]journalism.co.uk with more details on what you want to see discussed at the event. Tickets – on sale now! As of today, we have 50 earlybird discount tickets available for just £95 +VAT. Once all 50 have been sold, or by the end of Thursday 8 May, whichever comes first, the ticket price will rise to £130 +VAT. This time, we’re also giving you the chance to add-on an additional day of digital journalism training, with a news:rewired+ ticket, which gives you access to the conference on Wednesday 23 July as well as a one-day training course on Thursday 24 July – for just £245 +VAT. The earlybird news:rewired+ tickets offer delegates a 25 per cent discount on the Friday training course when booked together. Again, this is a limited discount, which also falls within the 50-ticket limit, or by the end of Thursday 8 May, whichever comes first. After this point news:rewired+ tickets will rise to £300, which gives you a discount of just under 15 per cent on the training course when booked with news:rewired. There will be three training courses on offer to attend on Thursday 24 July as part of news:rewired+. We will be sharing more details on the options available soon. Update: We have now announced the details of the three training courses on offer, which cover social media, data journalism and mobile reporting. Book news:rewired and news:rewired+ tickets at this link. Here is a round-up of some of the lessons shared at news:rewired on Friday 20 September. More than 30 speakers shared case studies from their news organisations, plus there were tips for digital journalism and advice on online tools. We’re pleased to announce VoxPopMe as the latest sponsor of news:rewired, which is being held at MSN UK’s offices in Victoria, London next month. VoxPopMe, which journalists can use to collect ‘videopinions’ from the public via their mobile phone, will deliver a short presentation at the one-day digital journalism conference on Friday 20 September. We still have some tickets left to news:rewired, although these are limited and expected to sell out. Buy yours now for just £130 +VAT. Here at Journalism.co.uk we’re counting down the days until our next digital journalism conference news:rewired, which takes place on Friday 20 September. We have a fantastic line-up of speakers from news outlets including: BBC News, the Guardian, GigaOm, Quartz, ITV News, Wall Street Journal, Vice UK, and many more…. The event is being held at MSN UK’s offices in Victoria, London. Ahead of news:rewired – full stream ahead we have been asked by some delegates about where to stay nearby. As a result we’re pleased to say The Georgian House is offering conference delegates a 10 per cent discount on its online room rate. The four-star bed and breakfast is located near to Victoria Station and just a 10 to 15 minute walk from the event venue at MSN UK, Cardinal Place, 100 Victoria Street, London, SW1E 5JL.